Some background: the part of shaving that's most attracted my attention are the razors and the blades. I have many brushes, which I enjoy, but I never really focused on brushes until talking with Todd O. about his new Rooney Heritage Victorian. His main focus, it turns out, is the brush, and he pays a lot of attention to the performance and feel. He urged me to get a Victorian from the current batch, and said why: the tips are extremely soft, but the bristles are quite resilient, so the feel on the face is good. Also, the way the knot's built seems to push the lather toward the tips instead of hoarding it in the interior of the brush. He also showed me how the wet brush (with no soap or shaving cream) feels slightly "tacky" as you rub a finger across the tips. When the brush dried, it had the porcupine appearance common to hooked badge bristles---the tips "stick" together in a Velcro-like way. (I'll try to upload a photo, but may not succeed.) That appearance is temporary: just brush your hand with the dried brush, and the tips will disentangle and present the usual smooth brush appearance. We decided that the "tacky" feel---and perhaps some of the softness---is due to the hooked bristles. Brushes with hooked bristles are relatively uncommon. Perhaps in some cases brushes are lightly trimmed to final shape, which would remove the hooks. Of the brushes I own now, the only ones with hooked bristles are the Victorian and---to my surprise---the two H.L. Thäter brushes I have. I happened to use them this week, and after talking to Todd O. I've been paying a lot more attention to the performance of my brushes. I noticed immediately that the Thäter brush I picked up felt really good on my face, and it had that odd combination of very soft feel but still lots of resilience. I attributed that to the sharply domed shape, with the center giving way but pushed back by the sides, or some such, when after the brush dried I noted the characteristic porcupine appearance of hooked bristles---on both the Thäters that I have (because the next day I of course used the other Thäter to see what it was like). I'm now embarrassed that I let those brushes sit so long without using them. They are startlingly good, and now will get a weekly workout. I'm really astonished by how they really do stand head and shoulders above most of my brushes. In the photo below (if this works) is the Rooney Victorian, with my two Thäters flanking it, in "porcupine" mode. Brushing the tips with my hands would make these look like a regular brush (see photos at vendor sites for the smooth view of the brushes---below is the view that you don't see in catalogs but that, possibly, indicates an exceptional brush). My goal---which I totally failed to mention---was to hear from guys who also have a hooked-bristle badger brush and see whether that's what makes much of the difference. In the meantime, I'm very pleased that I bought the Thäters: I didn't realize what a great brush I was getting. And I do think the super-dome shape has something to do with it. Well, it's not recent---it's been around since badgers. And I think it may be responsible for the noticeable softness of the tips (as the split ends are for the softness of well-broken in boar brushes). Thanks for the info, sir! Very interesting information. 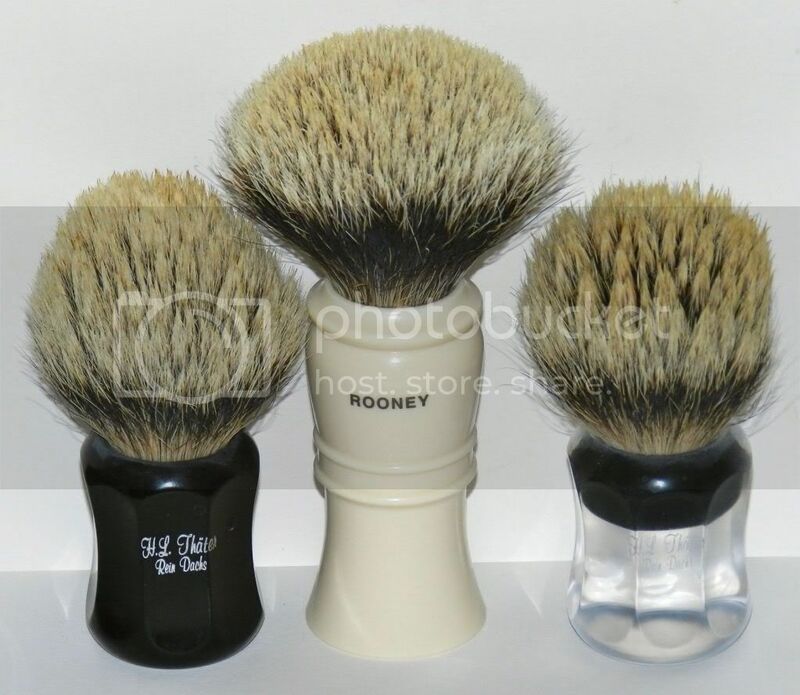 Aren't all the Rooney Heritage brushes like this? I think my "Stubby" 2XL is. Not sure. I have the Victorian. Let me try the Emilion, which I've not used since this discovery. I believe my Rooney Finests do the same, and I think I recall Shavemacs doing it too. My Rooney was like that and my current Thater is the same. Incredibly soft once wet and then they dry all prickly. No issues shaving with them. My own Rooney Finest (a Style 2) does not show this, nor do any of the Rooney Super Silvertips that I have. The Victorian does, as noted, and perhaps the Emilion as well. My one Shavemac does not, but that's just one from a very large range. Do your brushes that do this also feel "tacky" to a fingertip when they're wet? My Savile Row 3122 also has the hooked tips. Great feel on the face too. (04-01-2012, 12:28 PM)Leisureguy Wrote: Do your brushes that do this also feel "tacky" to a fingertip when they're wet? I'm not quite sure what you mean by "tacky." The Stubby, when wet, is almost gel-like on the face. This is a really good thread.Thanks for it,Michael. I have plenty of badger brushes with the hooked tips,but one they are all wet,they became really soft.It seems that some kind of badger hair dont "tolerate" hot water really well and the tips get hooked as you have explained. 'Hooked' filaments can be created way back at the sterilising stage of the hair's 'life'. If the hair has naturally very fine tapered filaments sterilising can cause slight splitting of the hair. Until the hair is used to form a knot and then used by the shaver in the completed brush the 'hooking' doesn't occur. We used to find that some batches of the finer super hair reacted this way, it was something that did create a different feel to the brush - not a bad feel, just a different feel to normal. (04-01-2012, 01:20 PM)Gary Young Wrote: 'Hooked' filaments can be created way back at the sterilising stage of the hair's 'life'. If the hair has naturally very fine tapered filaments sterilising can cause slight splitting of the hair. Until the hair is used to form a knot and then used by the shaver in the completed brush the 'hooking' doesn't occur. We used to find that some batches of the finer super hair reacted this way, it was something that did create a different feel to the brush - not a bad feel, just a different feel to normal. This is very good information to have! Thank you Gary. That's what I signed up for Phil! Definitely an asset to the community. Thanks for the reply Gary. I was hoping you would offer some insight to this thread. I love the feel of my "hooked badger" brush , but when its dry it sure looks and feels scratchy but when wet it's soft as velvet. Gary is hooking something that in the past was avoided by brush makers ? The reason I ask is I have never noticed it in my older well worn brushes.